Teaching poetry this term? 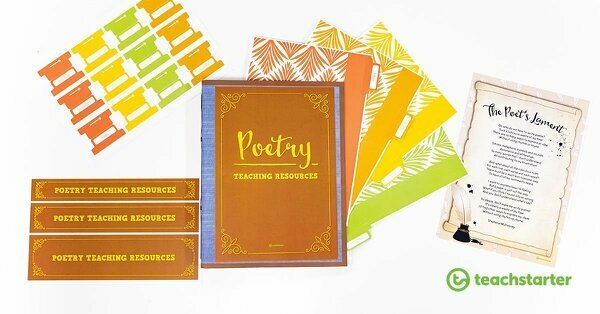 Our brand new Poetry Resources Folder Template is hot off the designer’s desk! 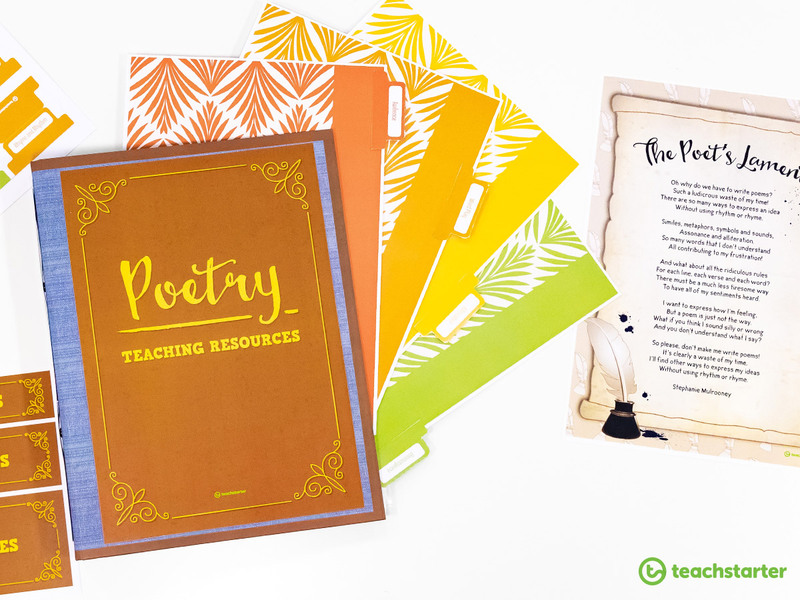 We know teachers love organisation, and this handy pack contains everything you need to file your teaching resources for your whole poetry unit! Our Poetry Resource Collection is home to a bank of fantastic unit and lesson plans. We’re all about saving you time and supporting you to plan and teach your poetry unit. To set up your folder, you’ll just need a ring binder, some plastic sheet protectors and our downloadable Poetry Resources Folder Template! The download is available in both colour and black and white Adobe and Microsoft Word versions. We’ve included a variety of labelled divider tabs for you to choose from, depending on how you’d prefer to separate your poetry resources. There are tabs for the different poetic devices, tabs for types of poetry, as well as blank tabs for you to write on! Attach each tab to a coloured divider page. The it’s time to fill your folder with all of our wonderful poetry resources! Our Exploring Poetry Unit Plan: A sequence of ten 60-minute lessons which looks at common poetic devices, and includes a task which may be used as an assessment piece. This resource is perfect for Grade 3 and Grade 4 Teachers. 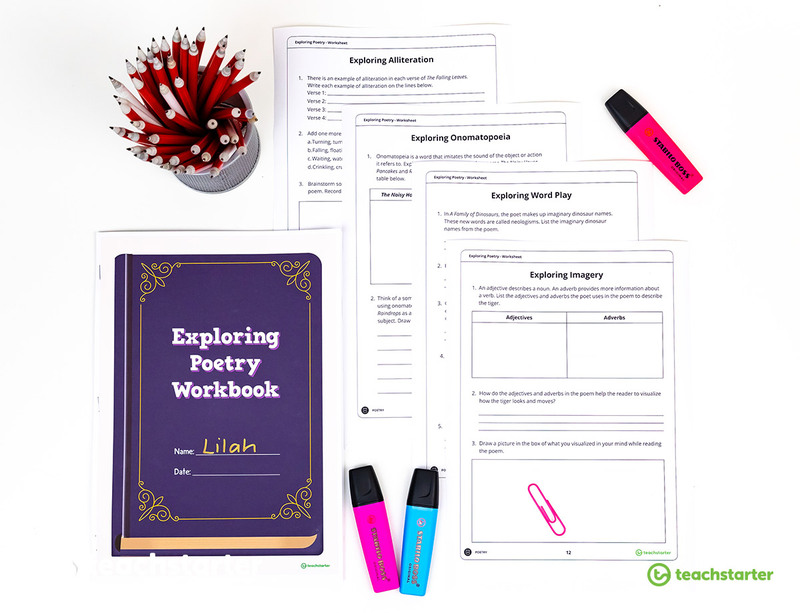 Exploring Poetry Workbook: If you’re teaching younger students, you may wish to work through this workbook to help familiarise them with the genre of poetry, and the basic poetic elements. Contains original, level-appropriate and curriculum-aligned poems and accompanying activities! This is one of our most popular poetry resources! 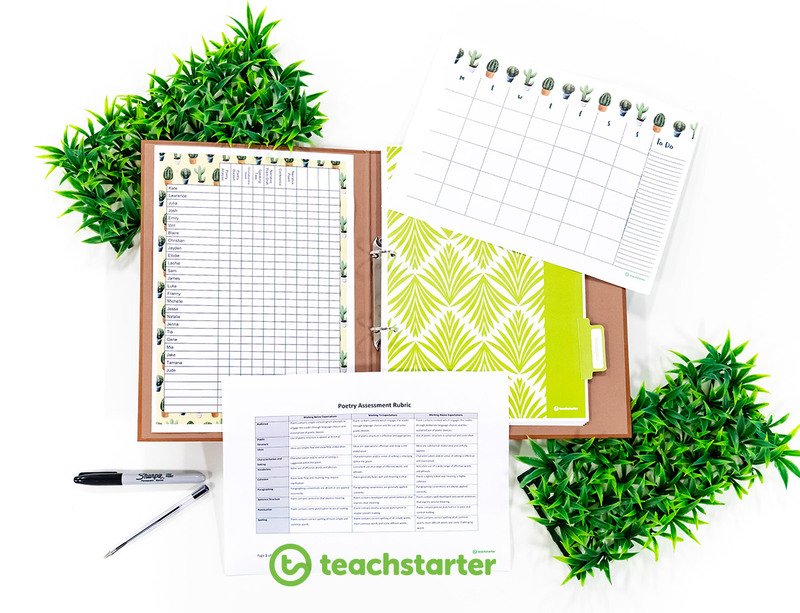 Class List – To track student task progress during your unit of work. Poetry Assessment Rubric: A NAPLAN-style rubric designed for teachers to assess students’ poetry. A workbook to help students become more familiar with the genre of poetry. A generic poetry comprehension worksheet. A pirate-themed printable class list. 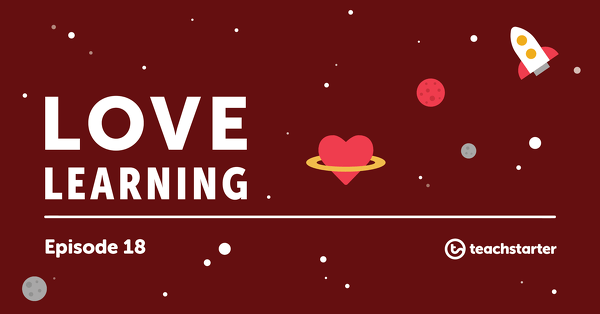 Experimenting With Poetry Unit Plan: Consisting of twelve 60-minute lesson plans, this English unit teaches students in Grade 5 and Grade 6 the common elements of poetry and explores how these may be applied to shape poems, limericks, odes and simple ballads. 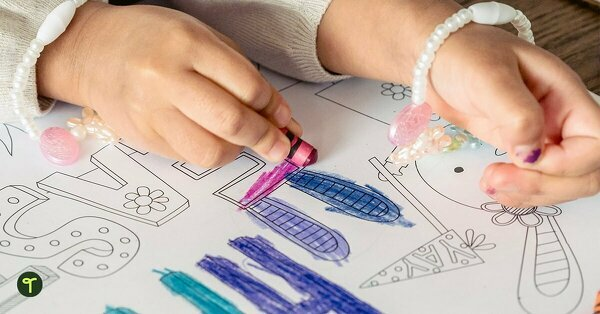 Elements of Poetry Workbook: Written for upper-primary students, this workbook contains poems and activities to teach about common poetic elements. This is one of those poetry resources that proves to be a favourite with our teachers! Poetry Analysis Template: An organiser to help students analyse poems. A 1 page template for students to use when analysing a poem. A cactus-themed printable class list. Are you teaching poetry at the moment? We’d love to see how you store your poetry resources! 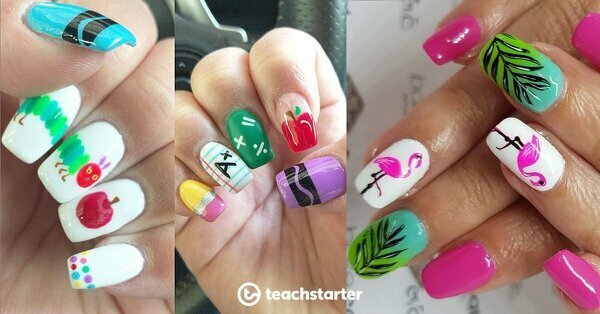 #teachstarter on Instagram for bragging rights!